Have a look at my Nairobi photos. The name "Nairobi" comes from the Masai expression “Enkare Nyorobi” and means "the place of cool waters". The popular nickname of Nairobi is "Green City in the Sun." The city is pretty green and has a dense tree-cover. I also included some pictures of Nairobi National Park, which is an underrated, full wildlife resort just outside the city. 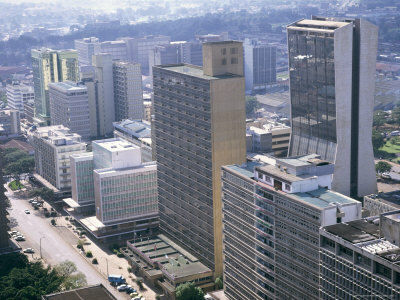 Above: Nairobi is the capital of Kenya and not only the travel and business hub of East Africa, but also one of the most important cities of Africa. One of four international headquarters of the United Nations is located here. 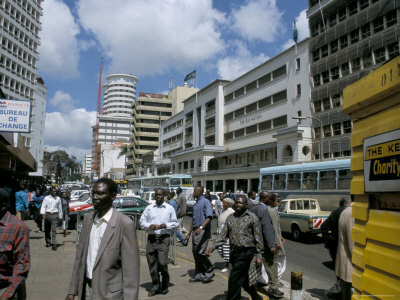 Above: Moi Avenue, one of the most prominent business and shopping streets in the centre. Nairobi has 4 million inhabitants, of which no less than 2.5 million live in the slums around the city. Most people doing a safari in Kenya fly in through Nairobi. 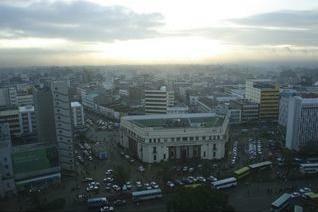 Above: The view over Nairobi from the Hilton Hotel. This is located in the heart of the city, at walking distance from the Kenyatta International Conference Center and next to the famous crafts market where you can buy traditional Kenyan products. 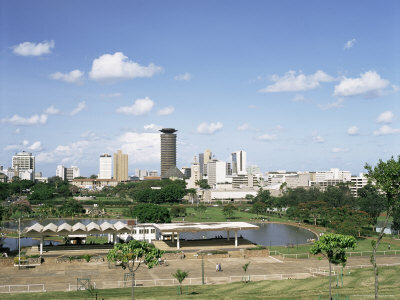 Above: Uhuru Park, located in Nairobi’s central business district. ‘Uhuru’ means freedom. The park is used for outdoor rallies, speeches and services. Former dictator Daniel arap Moi wanted to effectively destroy a large part of the park to place the 62-storey headquarters of his KANU party there, but the park was saved through a campaign led by later Nobel Peace Prize winner Wangari Maathai. 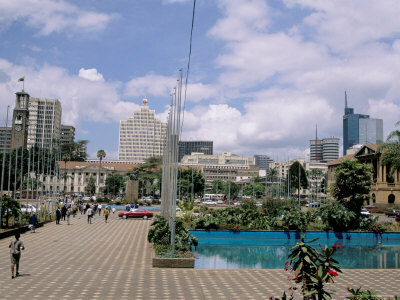 Above: Nairobi is centered around the City Square, in the Central Business District. The City Hall, the national Parliament, the Kenyatta International Conference Center, the Nairobi Law Courts and the Holy Family Cathedral are located around the square. 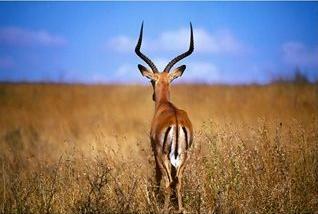 Above: A male impala in Nairobi National Park. This is an underrated, full wildlife resort located just outside the city centre. It’s one of the few places in the world where you can be in the middle of the bush and the wild animals with a 30 minute taxi ride from the city centre. 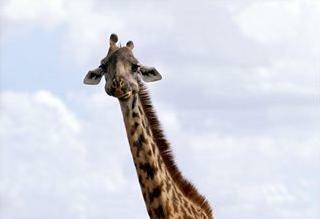 Above: A giraffe at Nairobi National Park. 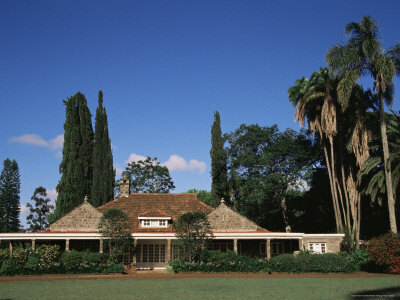 Above: One of my favorite Nairobi photos: the house of Karen Blixen, the famous Danish writer who lived in Kenya for 2 decades and who wrote “Out of Africa” under her pen name Isak Dinesen. This book was later turned into the 1985 blockbuster movie with Meryl Streep and Robert Redford. Above: Jamia Mosque in Nairobi. Some 10 percent of the Kenyans are muslim, a result of many ages of trade with and invasion with the Arabs across the Indian Ocean. That’s why most muslims live in the coast region. 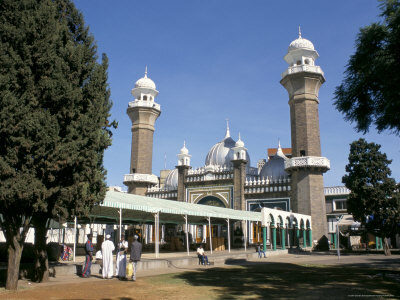 Jamia Mosque is one of the most prominent religious buildings in Kenya. Above: A steam engine at the Railway Museum in Nairobi. 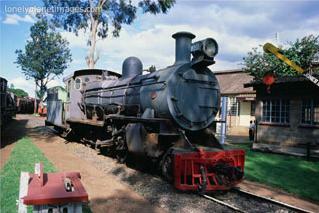 This museum is located in an old railway building and is dedicated to the history of the Kenyan railroads. Nairobi was actually built by the British from 1899 as a depot from where they built the railroads through Uganda and Kenya.